President Obama continues to hold a substantial advantage over congressional Republicans in public regard. Obama’s job approval is back in positive territory at 51%, after slipping to 47% in March. By comparison, just 22% approve of the job Republican leaders in Congress are doing, among the lowest approval rating for congressional leaders from either party in 20 years. Furthermore, a record-high 80% say Obama and Republican leaders are not working together to address important issues facing the country, and by nearly two-to-one (42%-22%) more blame Republican leaders than Obama for the gridlock. Despite GOP leaders’ poor job ratings, the Republican Party runs about even with the Democrats on leading issues such as the economy, immigration and gun control. Overall, 42% say the Republican Party could do the better job dealing with the economy, while 38% say the Democratic Party. 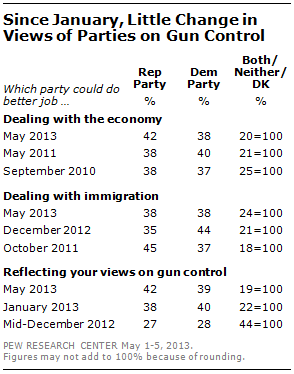 The public is similarly divided over which party could better handle gun control policy and immigration policy. The latest national survey by the Pew Research Center, conducted May 1-5 among 1,504 adults, finds that Republicans have particularly low regard for their party’s congressional leaders. 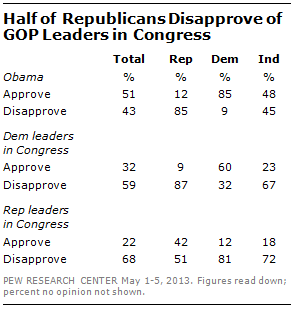 Just 42% approve of the job GOP leaders in Congress are doing, while 51% disapprove. This is far below the job ratings that Democrats give their party’s leaders (60% approve, 32% disapprove). 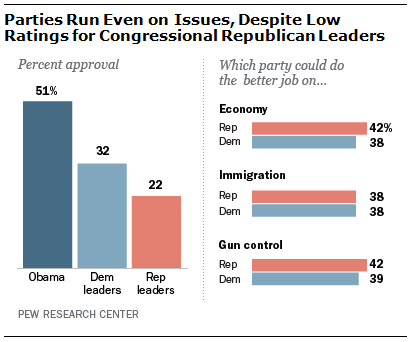 Despite their frustration with the party’s leadership, Republicans overwhelmingly say the GOP could do a better job than the Democratic Party when it comes to issues like the economy, immigration and gun control. By comparison, fewer Democrats side with their party on the economy and gun control, which is one reason why Republicans run even with the Democrats overall. On each of these three issues, independents are split as to whether the Republican Party or the Democratic Party could do better. As Obama works toward advancing his second-term agenda, the public is divided over whether he is someone who is able to get things done (49%) or not (46%). Views of Obama’s effectiveness have declined since shortly after his re-election, when more saw him as effective (57%) than did not (37%). While the public offers mixed views of Obama’s effectiveness in a gridlocked political environment, most say he fights hard to get his policies passed (67%) and 76% describe him as someone who stands up for what he believes in. Both impressions hold with majorities of Republicans, Democrats and independents. Views of his leadership and effectiveness, by contrast, are highly polarized. At 51%, Barack Obama’s overall job approval rating has edged back up from a recent low of 47% in mid-March. But it still trails his 55% approval rating in early December, a month after his re-election victory. Ratings of Republican leaders in Congress remain near all-time lows. By about three-to-one, more disapprove (68%) than approve (22%) of the job GOP leaders in Congress are doing. Republican leaders’ job approval has changed little since December of last year (25%). Democratic leaders are viewed only somewhat more positively. Overall, 32% approve of the job Democratic leaders in Congress are doing, while 59% disapprove. In December, 40% approved of the job performance of Democratic leaders. Republicans express mixed views of the job performance of their party’s congressional leaders: 42% approve, while 51% disapprove. By contrast, almost twice as many Democrats approve as disapprove of the job of Democratic congressional leaders (60% vs. 32%). Independents continue to take a dim view of the job performance of both parties’ congressional leaders: Just 23% approve of Democratic leaders’ job performance while 18% give GOP leaders a positive job rating. The Republican Party runs about even with the Democratic Party on three key issues: the economy, immigration and gun control. In recent years, neither political party has held a decisive advantage on these issues. The Democratic Party led on the economy through much of George W. Bush’s second term and Obama’s first year in office. But since 2010, about as many have favored the GOP as the Democrats. Similarly, neither party has had a consistent advantage on dealing with immigration. The current survey finds opinion split evenly; Democrats held a slim advantage in late 2012, while Republicans held a slight edge in 2011. And while the gun debate has drawn significant public attention over the past four months (see: Gun Debate Draws More Interest than Immigration Policy Debate, released April 8, 2013), it has not resulted in an advantage for either political party. In the immediate wake of the shootings in Newtown, Conn., Americans were divided over which party could better address gun control, and that divide persists today. Independents are split over which party can do the better job on key issues. Overall, 38% of independents say the Republican Party could do the better job on the economy while nearly as many (35%) say the Democratic Party. 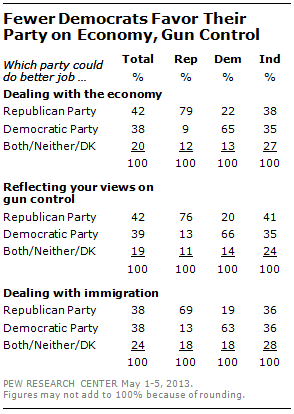 Similarly, independents are divided over who can better address immigration (36% say each party) and gun control (41% Republican Party, 35% Democratic Party). On all three issues, about a quarter of independents volunteer no preference between the two parties. Eight-in-ten Republicans (79%) say the GOP could do the better job dealing with the economy, while just 9% say the Democratic Party. Fewer Democrats (65%) say their party could do better on the economy, while 22% say the GOP could do better. Similarly, while 76% of Republicans say the Republican Party better reflects their views on gun control, 66% of Democrats choose the Democratic Party. On dealing with immigration, 69% of Republicans prefer the GOP while about as many Democrats (63%) say the Democratic Party could do better. The percentage saying that Obama and Republican leaders are not working together has risen steadily during Obama’s presidency. Currently, 80% say the two sides are not working together, up from 65% in February 2011 (shortly after Republicans won control of the House) and just 45% in early 2009. By nearly two-to-one, those who see a lack of cooperation are more likely to blame Republican leaders in Congress (42%) than Obama (22%) for the gridlock. 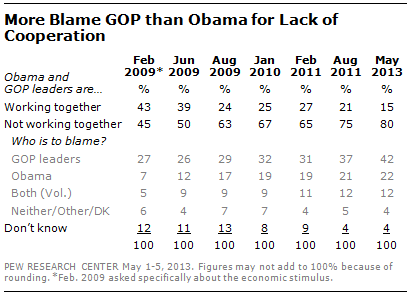 The percentage blaming Republicans is up 11 points since February 2011, while the percentage blaming Obama is little changed over that time period. Republicans and Democrats are about equally likely to say that GOP leaders and Obama are not cooperating, but Republicans are more likely to say their own party is at least partly to blame for gridlock than are Democrats. 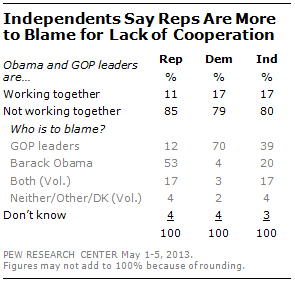 Overall, 53% of Republicans blame Obama for the lack of cooperation in Washington. However, 28% say either that GOP leaders (12%) or both Republican leaders and Obama (17%) are to blame for not working together on important issues. Democrats are less likely to see any blame on their side of the aisle. Seven-in-ten (70%) blame GOP leaders for the gridlock in Washington, while just 7% say either that Obama is most to blame (4%) or volunteer that both parties are to blame (3%). Independents are much more likely to say that Republican leaders are to blame for the lack of cooperation in Washington (39%) than Obama (20%); 17% volunteer that both are to blame. Following the failure of gun control legislation backed by the Obama administration, most continue to say that Obama stands up for what he believes in (76%) and that he fights hard to get his policies passed (67%). 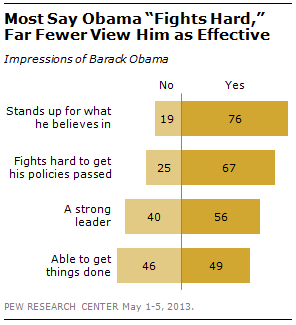 Most also say that Obama is a strong leader (56%); 40% say he is not a strong leader. However, the percentage saying that Obama is able to get things done has edged down since shortly after Obama’s second inauguration. In the current survey, about as many say Obama is able to get things done (49%) as not able to get things done (46%). In January, Obama was viewed as able to get things done by a 57%-37% margin. Majorities of Republicans, Democrats and independents agree that Obama stands up for what he believes in and fights hard to get his policies passed. There is far less partisan agreement over Obama’s leadership ability and effectiveness. Just 18% of Republicans view Obama as a strong leader and an identical percentage say he is able to get things done. 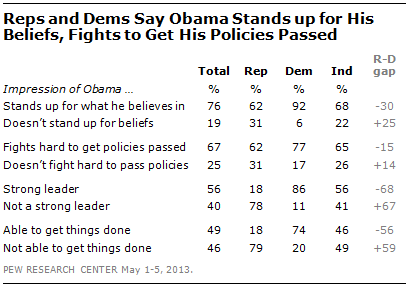 Fully 86% of Democrats say Obama is a strong leader and 74% say he is able to get things done. By a 56%-41% margin, more independents say Obama is a strong leader than not. However, independents are divided over whether Obama is able to get things done (46%) or not (49%). Impressions of Obama’s leadership and effectiveness are similar to those of George W. Bush at comparable points in their presidencies. Currently, 56% say Obama is a strong leader, while 41% say he is not a strong leader. Public views of Bush’s leadership were nearly the same in July 2005, in the first year of his second term (55% strong leader, 41% not). 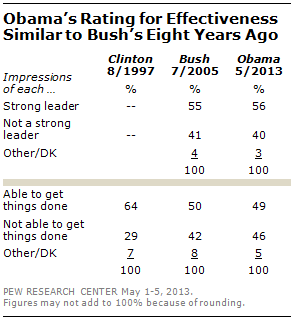 Bush also got about the same rating for his ability to get things done as Obama does today (50% vs. 49% for Obama). Bill Clinton received more positive ratings for effectiveness than either Obama or Bush in the first year of his second term; in August 1997, 64% said Clinton was able to get things done. Overall, 51% approve of the job Obama is doing as president, while 43% disapprove. Obama’s job ratings have ticked up since March (47% approve, 46% disapprove), but remain less positive than they were in December, immediately following his re-election (55% approve, 39% disapprove). Among independents, 48% approve of the job Obama is doing while 45% disapprove. Democrats overwhelmingly approve of Obama’s job performance (85% approve vs. 9% disapprove), while Republicans disapprove by a similar margin (85% disapprove vs. 12% approve).